These all-natural pure formulas have become the supplements of choice for alternative medicine practitioners across the country to aid those suffering from osteoarthritis, arthritis, joint pain, surgery recovery, lack of energy and so much more. Our products are derived from the velvet antler of our own ranch-raised MN Board of Health-certiﬁed elk herd. 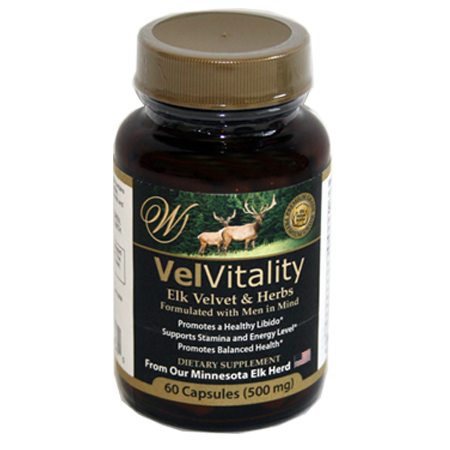 Research and experience have proven the remarkable beneﬁts of daily supplementation of Elk Velvet Antler. For more than 2,000 years, Eastern cultures have faithfully included Elk Velvet Antler in their daily diets and as a natural remedy for countless ailments. Elk Velvet Antler is supported by the Food and Drug Administration as a daily supplement to provide support for joint structure function. I have been taking VelveFlex for several months and thought it would be a good idea to give it a the straight Elk Antler Velvet, VelveTan a try. I was told by Deb at Wapiti that a lot of guys like to go 50% VelveFlex and 50% VelveTan for their daily routine. I’m trying different combinations to give it a real scientific trial. One never really knows what works best until try & I’m glad I’m trying this to find out what works best for me. Definitely worth the time and money! Finally! A natural product that actually works. I started having some issues back in 2004. Most days I experienced a lot of discomfort and could hardly move, I felt like I was 100 yrs. old. I read about Elk Antler Velvet and how well it worked on people as well as pets. I checked out the Wapiti Labs Inc. website and decided to call their customer service reps and explained my issues. They had me order 2 products, Velvatan and Velvagin. Two weeks or so later I was reaching for something in my kitchen… I stopped, I could reach for it no problems and no discomfort. NOW I feel my real age again! I can go for walks, I have more energy and I’m going to look for work.